I think we were all a tad surprised by the announcement towards the backend of 2017 that both DOOM and Wolfenstein II: The New Colossus would be coming to the Switch. After all, both titles are quite the lookers so one would think that it wouldn’t exactly be the simplest task getting both games to run at a level that us as the consumers would be happy with. But after an excellent port of DOOM, I’m happy to report that the porting wizards over at Panic Button have successfully brought Wolfenstein II: The New Colossus to Nintendo’s portable machine with only one really obvious drawback needed to make it run on a handheld device, and that is a hit on the visuals. To get this out of the way from the outset, this is the exact same game that the other platforms got late last year, no modes have been cut, and the gameplay has been left untouched. If you know about the game on other consoles or have played the original game then you know what you’re getting. If you haven’t then what you can expect is yet another top quality game from Bethesda, one that has all the hallmarks needed for a great first-person shooter. It’s not up there with the all-time greats, no, but it’s certainly one of the better ones since DOOM landed in 2016. This is a direct sequel to 2014’s Wolfenstein: The New Order, as implied with the ‘II’ in the title. It follows on immediately after the conclusion of that game and as such, if you’re new to the series or don’t have anything other than a Nintendo console, then you’re missing out on a lot of the plot points that make up the surprisingly good story. You are able to follow along with the plot, but a lot of the big moments, especially in the early hours of the game, certainly won’t shock or have as much of an impact on you like it will have for somebody like me, who played and completed the first game. So, for this reason, it is a slight shame that The New Order hasn’t also been ported over, but, we shouldn’t ask for too much. There is a brief summary video included to explain things to new players, which is a nice touch, but it still doesn’t beat actually fully following the whole of the events from the first game yourself. You play (as you always have in Wolfenstein) as William Joseph Blazkowicz, nicknamed rather awkwardly, as B.J. 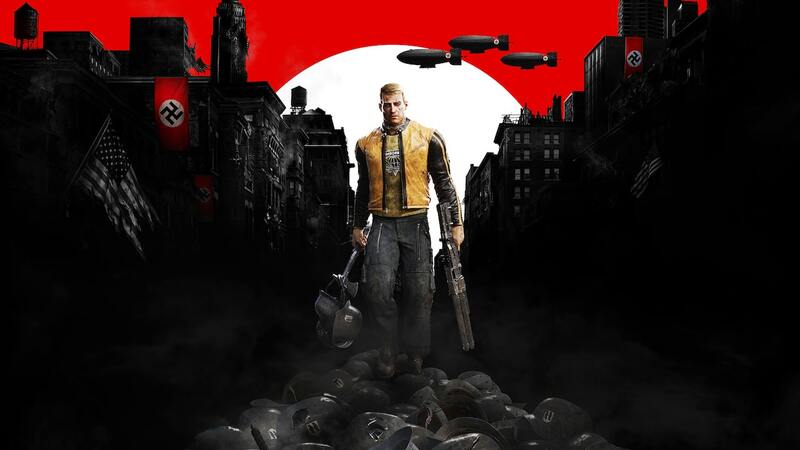 The game takes place in alternate historical 1960’s where the Nazi’s won the Second World War. It touches on some very sensitive subjects and occasionally may stray too far for some people. It never felt like it did it just for the sake of it and it certainly wasn’t afraid to encroach on some of these themes head-on. It has been very rare to see games of this ilk and with these themes appear on a Nintendo console throughout the years, so I am really glad we are starting to see more and more of them now as there is no reason why we can’t have these games with a darker tone appear on a Nintendo device. Wolfenstein II: The New Colossus plays like a well-oiled machine. It’s a very fast and slick game that almost harkens back to the older first-person shooters we know and love. The shooting mechanics feel just right, too. Each gun feels unique and I often found myself switching between guns because they were all so much fun to use. You are also able to tackle most areas in the game in two ways, going in all guns blazing or taking the more stealthy approach and avoiding the riskier gunfights. If you came here from playing DOOM, then I would imagine you want to run-and-gun your way through the game, which is my personal preference. You also have an RPG like upgrade system added in for good measure too. You can find upgrade kits for weapons scattered around levels and these allow you to upgrade your weapon of choice, each having three upgrades to choose from. This can be traced back to whether you wanted to be stealthy or not as usually the upgrades can be categorized into one of these. Some help you be stealthy, such as the suppressor for the pistol, and some give you more firepower, such as the armor piercing bullets you can obtain with the automatic rifle. It’s not just weapons that can be improved either, as you can also gain perks by completing challenges. These are good because certain perks you want might require you to play differently than what you would do usually. For example, if you wanted to have increased movement whilst crouched, then you need to kill 10 enemies with stealth takedowns in order to gain it, which might not be something you would naturally do otherwise. It’s a great system and it’s a system that I think a number of titles would benefit from having as it requires a bit more skill to unlock the specific thing you want rather than having a point to spend and you then simply choose it from a big list. Of course, the big question a lot of people will be asking when it comes to Wolfenstein II: The New Colossus on the Switch will be how does it look and play. We all know that it’s not going to look as good on the Switch as it does on other consoles because it’s a handheld device after all. It does showcase some of the best, realistic looking graphics on the system to date and it ran at a (seemingly) steady 30 frames-per-second with very minor hiccups here and there. The more the area opens up, however, the more the graphics do suffer as a consequence, but it never affected my experience or enjoyment of the game. Now that was playing in TV-mode. Unfortunately, playing in portable mode results in even more blurriness, it isn’t terrible or game-breaking but it is very noticeable at times. That, of course, is the compromise you have to take if you want to play it as a handheld title. If you take a step back and think about it, you’re playing a powerhouse of a game released less than a year ago that was designed for home consoles much more powerful than the Switch, which is a tiny handheld device, and the only thing that’s noticeable is that it’s blurrier than before, I think that’s excusable for most. But if you do want the superior experience, there’s no doubt that you should play it on the TV. Motion controls have been brought over from the Switch release of DOOM, too. Now I am a massive advocate for motion controls if they’re implemented right. Splatoon gets it right and you can even point to something like Resident Evil 4 and say that they took one of the greatest games of all time and made it better on the Wii with the inclusion of motion aiming (in my opinion). I know that not everybody likes that kind of experience as much as me and that they would rather play with the standard aiming, which is fine. In Wolfenstein II: The New Colossus, however, I would hope that you at least give it a go, because you are able to fine-tune your aiming so precisely. I am not saying do every single movement with motion, as it doesn’t work that well like this. Its the little touches that help you line up the perfect shot that feels so intuitive. The motion controls aren’t all good, however, there are certain instances in the game where things do get a little bit too hectic because the game is so frantic and fast, it can start to be jarring and disorientating at times trying to use motion to aim. I did encounter a couple of glitches whilst playing, none of which were really that major, one just meant I had to load up my save file (which put me back about 30 seconds) as the game basically froze me out of putting down a collectible (it must have been extra special) so my screen was just stuck on the text that accompanies it. Another minor bug happened when I paused the game, the menu items kept flickering and at points would disappear for a good few seconds before reappearing again. It is of course, entirely possible that these bugs will be ironed out sooner rather than later. Wolfenstein II: The New Colossus is yet another solid port by the people over at Panic Button and it really is excellent what they are doing. It allows Nintendo gamers to experience these types of games which have, in truth, been missing for such a long time. It suffers slightly in handheld mode which is one of the main selling points of this version. Overall, it’s a brilliant FPS that deserves its place on the Switch and one that I urge fans of the genre shouldn’t miss out on.